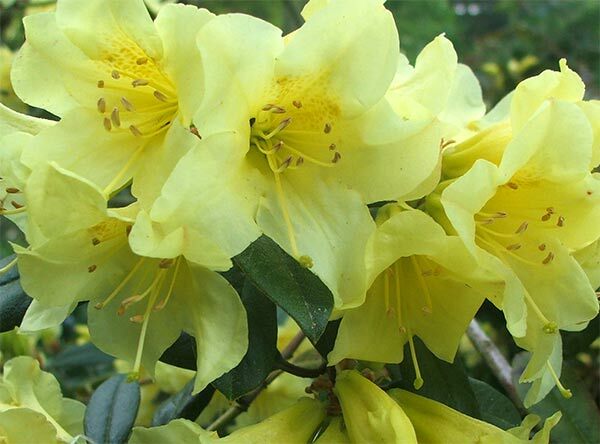 My rhododendron Saffron Queen has led a bit of a fairytale life. First she was dumped in a bargain bin, whence along came a knight - could that possibly be changed to knightess? - in gardening armour and she was rescued. Phew! Her next two years were spent underneath pine and gum trees. Things looked OK in spring when first planted - the purple honesty was in flower, and everything looked quite nice and moist. But during the summer she suffered dreadfully - irrigation never touched this ill-designed garden. So one summer, sick of trying to bucket in water, the gardener dug her out, and threw her under the hedge with other garden rubbish. Saffron Queen was heartlessly left for dead. But our heroine had other ideas, and the very next spring, still stuck under the Leyland Cypresses, she started bravely flowering. This made the gardener feel sooooo guilty. A place was quickly dug for Saffron Queen in the new garden behind the Willow Tree, where she has lived happily ever after! Hee hee. 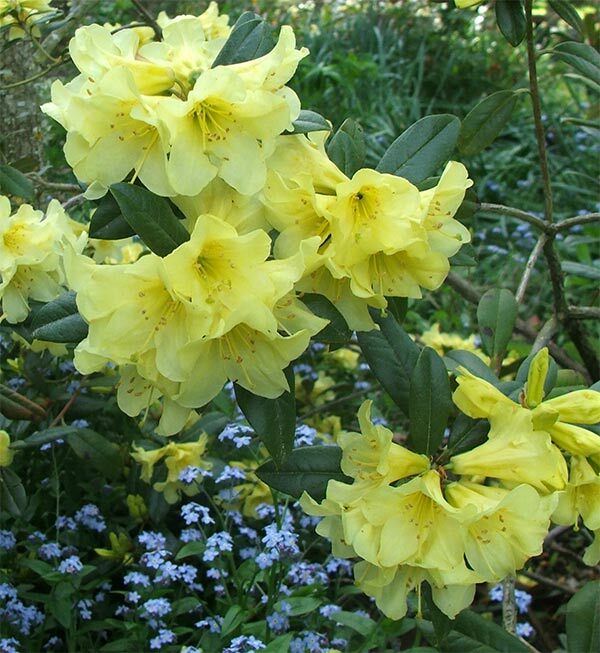 Now I like this rhododendron very much - her soft lemon flowers bloom in the middle of spring, surrounded by pale blue forget-me-nots. And I admire her sense of survival. What a meany, that gardener who mistreated her!